Aging.AI 2.0 is now available for testing. Please use your recent blood test to guess your age. Putin, Evgeny, Polina Mamoshina, Alexander Aliper, Mikhail Korzinkin, Alexey Moskalev, Alexey Kolosov, Alexander Ostrovskiy, Charles Cantor, Jan Vijg, and Alex Zhavoronkov. "Deep biomarkers of human aging: Application of deep neural networks to biomarker development." Aging 8, no. 5 (2016): 1-021. 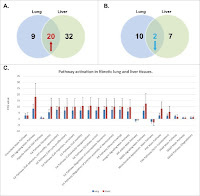 Collaboration of Insilico Inc. with Atlas Regeneration Inc, Vision Genomic Inc and Howard University has given two high impact papers to explain use of newly developed Regeneration Intelligence tool for the identification of perturbation in pathways of lung and liver fibrosis and glaucoma. It can be used as diagnosis tool for the fibrosis that is often mis-diagnosed. Fibrosis is a age related condition that is marked by the accumulation of extracellular matrix that occurs in wide range organs. This leads to changes in the structural and functional properties of organ that leads to pathological conditions. Lungs and liver are the most commonly affected by fibrotic situation leading to development of idiopathic pulmonary fibrosis (IPF) and hepatic fibrosis. By their new Regeneration Intelligence algorithm they were able to pin down to TFG-beta, IL6 and ILK signaling pathways, which were found to be conserved in fibro-genesis. 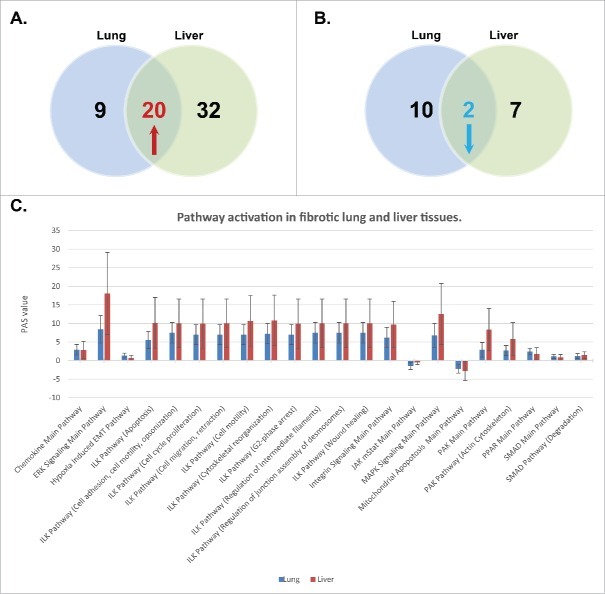 The software provides a validated mathematical frame work for assessment of signaling pathway alteration that drives the fibrosis in organs like lungs and liver. This work supports a theory that conserved signaling elements may shared by various fibrotic organs. It provides a new evidence that evolutionary conserved pathways can be used as therapeutic drug targets. The work was highlighted in Eureka Alert Science Magazine and Business Standard news letter. The scientific paper can be downloaded from this here. Figure 2: It shows the pathology of formation of glaucoma due to increase intra ocular pressure due to blockage in the removal of AH. A) shows TM and optical nerve head containing TC. B) shows TM located between cornea and iris. It shows that AH produced by ciliary body is moved towards anterior end shown by arrows and expelled into schlemm's canal via TM. C) shows flow of AH into schlemm's canal through juxtacanaliular tissue. AH outflow is blocked due to clogging in TM leads to increase in intra ocular pressure. D) Optic nerve head containing axon of RGC and lamina cribrosa structure. E) shows morphology of collagen fibres of lamina cribrosa. F) SEM trabecular meshwork and G) SEM of lamina cribrosa. They have found that TGF-beta causes activation of pro-fibrotic pathway in TM and LC. This activated pro-fibrotic pathway causes extracellular matrix re-modelling in TM and LC. This makes TM less efficient in draining the AH. This causes LC more susceptible to damage due to increase intra ocular pressure caused because of increased AH. 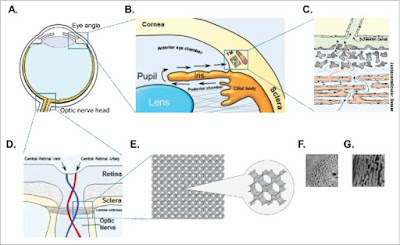 They propose molecular pathways that could be used for developing therapeutic intervention against glaucoma. The significance of the finding was recently discussed Eureka Alert Science Magazine and Medical News. These two papers shows a proof principle that there are some common age related signalling pathways that are shared by organs. Regeneration Intelligence based mathematical frame work gives an opportunity to explore this tool towards study of common signatures for age related fibrosis in other organs of human body. This may give us an opportunity to design an effective therapeutic strategy to fight age related disease like fibrosis. Mergers Can Solve Ageing Problem!! Merger of scientific brain may help to find out newer ways to fight ageing. * 1983: Their research showed that low doses of aspirin may help in reducing the incidence of heart attack. They also recommended the use of co enzyme Q10 (CoQ10) as an anti ageing nutrient. *1997: Introduced s-adenosyl methionine (SAM) for alleviating depression, arthritis and liver diseases. *2006: A relatively better form of CoQ10 that is absorbed relatively better than parent product. *2010: They stressed that pomogranate, resveratrol and quercetin may help in fighting ageing. *2012: Introduced a product featuring oleuropein that helps in modulation of arterial resistance and stiffness. *2013: Introduction of supplements that consists of polyphenols gastrodin that works as brain shield against antioxidants, inflammatory and excitatory damage. *2015: Introduction of pollen extract that promote prostate function and healthy urination. In silico Inc. has been a major point of attraction in my blogs about ageing. The company is being operated from John Hopkins University. They are a group of computational biogenrontologists who believe that they can cure ageing. The group is extensively working in the field of developing computational models for coming closer and closer to fight ageing. C. In Silico Inc. Collaboration With BioTime Inc.
BioTime Inc is a clinical stage regenerative medicine company that was focuses on the development of newer technologies fight ageing via. pluripotent cells. Unlike other pharmaceutical products that works on the basis of molecular drug targets, pathways and genetic expression profiles; BioTime's approach has been at the cellular level. Where the pluripotent cells can replace the damaged cells to provide therapeutic output. The simple it sounds the more complex it is. Regeneration of tissue from embryonic cells and formation of scar tissue for an adult for therapeutic purpose is extremely complex process. Hence, in June 2016 they collaborated with Insilico Inc. to study this complex process via machine learning method. 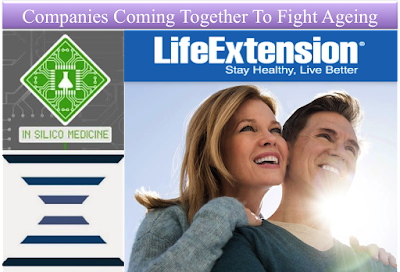 The idea of this collaboration was combine the technological advances of AI by Insilico Inc. and pluripotent cells based therapy by BioTime to produce next generation therapeutic solutions for cancer and age related disease..